The Tapestry is Officially Launched! Our ambitious plans to create a truly international embroidery to commemorate and preserve the legacy of the global Scottish Diaspora have now been officially launched. On 28th June the project team gathered to unveil the project before the gathered media at the Scottish Storytelling Centre in Edinburgh. The project is led by Prestoungrange Arts Festival, building on their experience creating the now famous Battle of Prestonpans Tapestry in 2009-10. Like their first tapestry - which has drawn over 120,000 visitors since its completion - this will be first and foremost a community arts project, with its base in Prestonpans. It will see communities across Scotland interacting and inter-relating with others in 25 nations stretching right across the globe, to develop an extraordinary visual record of the Scottish Diaspora. Those 25 countries have been selected as being the key destinations for Scots emigration across the centuries, and from their manifold experiences of Scots migration will emerge a series of fascinating and personal tales: it is these stories which will come together in the Scottish Diaspora Tapestry. In each target country, the emergent stories are being collated and researched. Then local volunteers will begin to embroider their tales onto square linen panels (50cm x 50cm), with Andrew Crummy working hard to develop the various stories into inspiring and striking designs with the help of the communities themselves. Yvonne Murphy and Gillian Hart are co-ordinating the research, and will be the guiding hands in helping the the hundreds of stitchers across the world to create their panels. Experienced stitchers themselves, they have already embroidered the beautiful logo panel (shown left) to Andrew's globe and compass design. Arran Johnston and Gordon Prestoungrange are behind this website and are responsible for maintaining and developing it as the project advances. It is intended as not only the key archive and resource for the Tapestry and its tales, but also the main method of communication for all those interested or involved. Kris Cunningham, the Prestoungrange Arts Festival's long standing and highly successful media co-ordinator, will spearhead the preparation of nationwide events for the Tapestry's completion year of 2014 as well as managing all press and media activities. The Scottish Storytelling Centre was the chosen spot for the official launch of the project: not only have we been working with them from the outset, but the centre also hosted the Battle of Prestonpans Tapestry in 2011 and so knows well how the power of a tapestry can bring stories to life. Dr Gordon Prestoungrange, who initially had the idea for the new tapestry, opened the event by explaining the inspiration behind it and his hopes for its success. He was also delighted to welcome Billy Kay (below left), whose book The Scottish World proved such a spur to the project in its early days by demonstrating the value of gathering personal and human stories from the Diaspora. Guests also heard from Professor Petra Wend, Principal & Vice Chancellor of Queen Margaret Univeristy (below right) about her role in encouraging the development of the first pilot panels of the Tapestry in Barga. Petra discovered first hand the dynamic enthusiasm the project is able to generate on the ground. Yvonne Murphy then explained more the detail regarding how the designs for the Tapestry would evolve out of the community stories, and how the panels would be able to reflect the exciting array of cultures which the Diaspora engages. 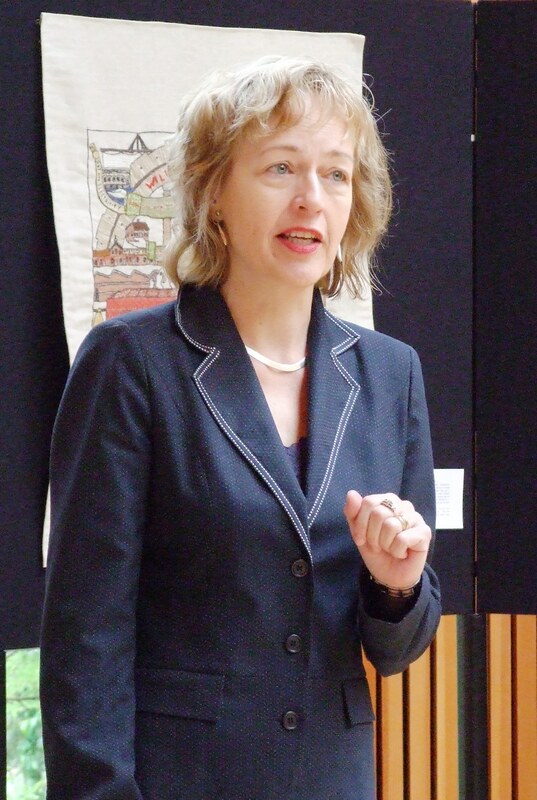 Nor will the project neglect the Reverse Diaspora - communities from overseas which have migrated into Scotland over the centuries will also be able to explore their heritage through the Tapestry. We are delighted that the project is receiving active support from CreativeScotland, the Scottish Government, and the Baron Courts of Prestoungrange & Dolphinstoun, as well as from EventScotland and Homecoming 2014 who are working closely with us as we progress. Since Scotland's Diaspora spreads across the entire globe, from Norway to New Zealand, North America to South, and from Corby to China, there are considerable amounts of research and travelling to be done, and major expense along the way too. Whilst the Barons Courts have enabled the project to get under steam, we are of course delighted to announce that the Scottish Government and CreativeScotland have also offered additional grants. Having raised £140,000 in total, the biggest focussed funding ever received by the Arts Festival since its foundation in 1997, the project is able to proceed in line with its intended scope. With the pilot panels in Sweden and Italy well underway, we are now working to secure the completion of the whole tapestry - 25 countries each producing between six and ten panels each - by the end of 2013. No easy accomplishment, but we are confident that the project with gather significant momentum as it develops. The completed panels will all be received with due fanfare in Prestonpans, and a major programme of events - including a spectacular grand display of the entire tapestry - will be scheduled for throughout 2014 in tandem with the theme of the Homecoming celebrations. Those events will also feature homeland communities here in Scotland - either those places in which the Diaspora communities have roots, or those in which reverse diaspora communities have been established - and they will be of crucial importance in expressing the true legacy of the Diaspora past and present. We'll be looking for eager volunteers willing to interpret this rich heritage not only through tapestry but also in song, dance, music, drama, storytelling, poetry and more besides! And so, it is with enormous pleasure that the project team is able to announce that the Scottish Diaspora Tapestry is now officially underway!